Habitat, located in Canterbury in Sydney's Inner West. Comprising 134 apartments and townhouses, Habitat was designed by architectural firm Turner, with an emphasis on connection between indoor and outside green living spaces. The one-, two- and three-bedroom apartments priced from $455,000 include outdoor green space, lush landscaping featuring outdoor room-like areas and an outdoor cinema for the residents private use. The suburb is undergoing massive regeneration and growth, attracting families and professionals which is reflected in recent research. Apartments in Canterbury recorded a 105% increase in rents from 2003 to 2013, the fourth highest in Sydney. 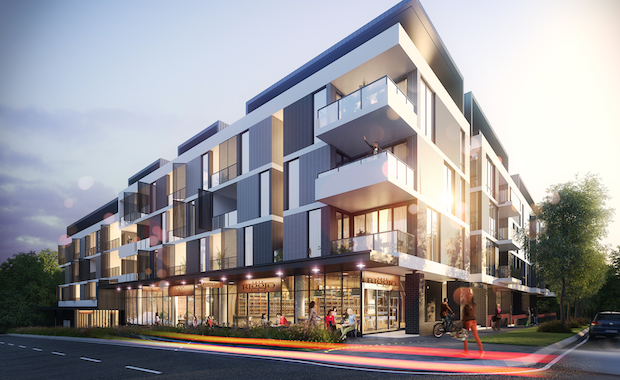 “We expect strong interest from a cross section of buyer groups who will respond to Habitat’s competitive pricing, quality of finishes and landscaped outdoor areas,” said Ged Rockliff, Head of Savills Residential Projects. Construction is scheduled to start at the end of 2014 with competition by mid-2016.